Then John said to him, “Beware, Symeon, lest the Devil wishes to jest with you.” Symeon said, “Only, do not forget me in your prayers, just as I won’t forget you, and God and your prayers will save me.” Again his brother began to admonish him and say, “Beware, be on your guard, brother Symeon, unless as the desert gathered together, the world disperses; and as silence helped, commotion hinders; and as much as keeping watch brought, you lose through sleep. Be on your guard, brother, lest the delusion of worldly things corrupt the prudence of the monastic life. Beware, lest the fruit from the privation of women, from whom God has saved you until today, be destroyed by spending time with them. Beware, lest the love of possessions carry off poverty, lest foods fatten the body, which fasting had melted away. Beware, brother, lest you lose your compunction through laughter and your prayer through your carelessness. Beware, please, lest when your face laughs, your mind be dissolved; lest when your hands fondle, your soul fondles as well; lest when your mouth eats, your heart eats as well; lest when your feet walk, your inner silence dances along recklessly; and to speak concisely, lest as much as the body does outwardly, the soul does inwardly. But if you receive strength entirely from God, brother, so that whatever the forms, or words, or actions the body makes, your mind and your heart remain unmoved and untroubled and in no way are defiled or harmed by them, truly I rejoice in your salvation, if only you would pray to God, so that he won’t separate us from each other in the world to come.” Then Abba Symeon said to him, “Do not fear, brother John; for it is not by my own will that I wish to do this, but because God commands me. And you will know through His help that my work was well-pleasing to God by this: that before I die, I will come and call you and embrace you, and in a few days, you will join me. But get up, and let us pray.” And after they had prayed for many hours and kissed each other’s breast and drenched them with their tears, John let go of Symeon and traveled together with him a long distance. 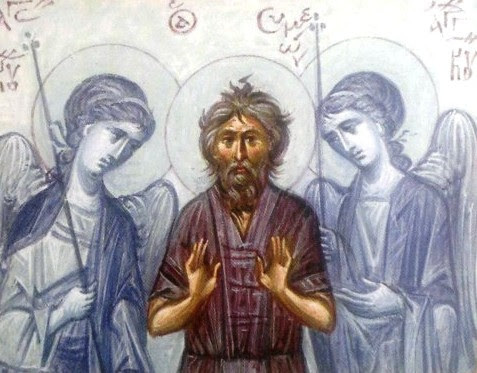 For his soul would not let him be separated from him, but whenever Abba Symeon said to him, “Turn back, brother,” he heard the word as if a knife separated him from his body, and again he asked if he could accompany him a little further. Therefore, when Abba Symeon forced him, he turned back to his cell drenching the earth with tears. Then straightaway Symeon ran ahead to the holy city of Christ our God [Jerusalem]. For during that time, he thirsted greatly and burned, as he said, yearning to savor Christ’s holy places. And arriving at Christ’s holy and life-giving tomb, and the holy, saving, and victorious Golgotha, he fulfilled his desire. He remained in the holy city for three days, visiting the Lord’s all-holy places, worshipping and praying. And his every prayer was that his works might be hidden until his departure from life, so that he might escape human glory, through which human arrogance and conceit arises, and which also made the angels fall from heaven. For he had heard Him who said, “The righteous cry out, and the Lord hears them” [LXX Ps 33:18, RSV Ps 34:17]. For when he performed such miracles and accomplished such unexpected things, as can be learned from what follows, the pious one’s works were not manifest to people. For his request was that, until his death, it might be just as if there was a veil over the hearts of those who saw the things he did. For, I say, indeed, if God did not conceal the blessed one’s virtue from people so that they might not glorify him, how was it that he was not manifest to all when he cured those possessed by demons, and again when he held live coals in his hand, or when often he predicted the future for some, while to others he announced what had been said about him far away, when in the desert he gathered up nourishment of all sorts miraculously from nowhere, or when also he converted Jews or heretics to the right belief or cured the sick, or rescued others from danger? Also he often brought some disreputable women and prostitutes to lawful marriage through his jesting; others he made chaste after captivating them with money; then he spurred them on to pursue the monastic life by means of the purity he had acquired. And I am not surprised, friends of Christ, that he remained unknown while he accomplished these things in God’s name. For He, who often makes the virtues which have been hidden from His servants manifest to all, by His plan also made manifest to all the virtues of this saint which were unknown. From the Life of Symeon the Fool 2.